With solar power every sun ray that hits your roof is a chance to lower your electricity bill and your carbon footprint. Over a million have already chosen solar, and are being rewarded for it. Many homeowners and business owners report that they have cut their energy bills anywhere between 50% and 90%. As an example, let’s say your energy costs are $400 per month. If you calculate conservatively that you’ll cut your costs by 50% to $200 per month, installing solar panels will save you $2400 per year. If you have a business that spends $1000 per month on energy and you can lower that number to $500 per month, that’s $6000 per year in savings, thanks to a solar energy solution. Installing solar is one of the most significant investments you will make. You’ll see immediate reduction in your energy bill, shield yourself from increasing energy rates, and enhance your energy independence! In fact, a system from PINANK ENERGY can provide a quick pay back within 3 years and the rest 20 years of operation – free of cost. Investing in solar power plants attract tax savings via 80% accelerated depreciation and IRR that can go high as 30%, that’s better performance than you’d get from the stock market! Feed-in tariffs credit your bill when your system generates excess solar power. Sometimes, solar panels generate more energy than you use which means that you may qualify for a credit on your energy bill for sending energy back into the power grid. This is called a feed-in tariff. The rates depend on the state you live in, and may be funded by your state government, your energy retailer, or a mix of both. Renewable energy, also know as ‘green energy’, is electricity that’s powered by natural sources such as the wind, water and sun. Renewable energy offers a carbon-free alternative to traditional fossil fuels, and its use is growing here in Australia and overseas. The development of technologies in the renewable space is allowing us to push the boundaries of where we can incorporate renewable into our every day lives. And while some of these technologies are yet to prove commercially viable, it’s an exciting time. While we may not be ready to rely 100% on renewable, we are moving towards a more balanced future where solar, wind and hydro play a more central role. Research and development in renewable energy is an exciting space, with new ideas being explored all the time. Below are some of the renewable energy sources that are currently used in Australia (to different degrees). Without a doubt, the long-term trend for electricity prices is upwards. 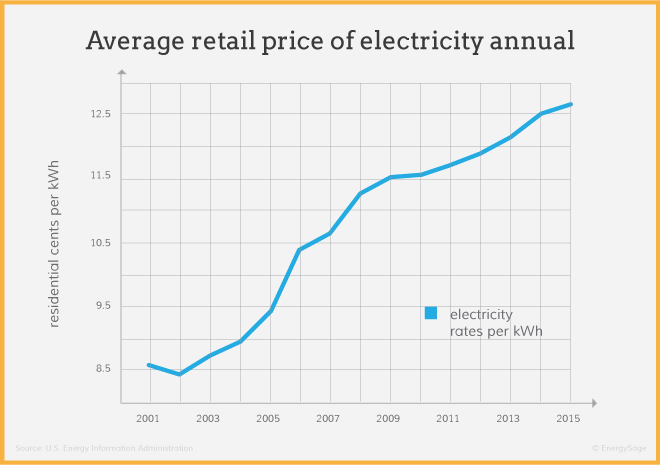 Over the past decade, electricity prices have risen by an average of three percent each year. Eliminating or significantly reducing these costs will save you a lot of money in the long run. By going solar, you also protect yourself against rising prices and make your monthly bills more predictable. With solar you produce your own energy, so it takes away the anxiety associated with rising and fluctuating energy prices. Let’s assume electricity prices will continue to rise by three percent each year. The typical U.S. home spends about $1,200 annually on electricity. If you buy a system that meets 100 percent of your electricity needs today, you will have an extra $1,200 in your pocket a year from now. The following year, when prices go up, you’ll save $1,236. Your savings will continue to grow for the 25+ years that your panels generate electricity, adding up to $32,000 over the lifespan of your system. Even if you don’t have the cash to buy a solar energy system up front, you can still reduce energy costs by financing your solar panel system with a solar loan, solar lease, or solar power purchase agreement (PPA). Most solar financing options require no money down and reduce your monthly expenses from day one of installation. As an added benefit, your monthly energy costs will no longer fluctuate – they will simply be the monthly amount of your loan or lease payment. In many ways, your solar power system is a financial product – one that is capable of generating annual returns ranging anywhere from 10 percent to more than 30 percent. The average EnergySage shopper pays off their solar purchase in just seven to eight years and receives free electricity for the remainder of their solar panel system’s 25+ year lifespan. Electricity Rates: How high are your current electric bills? This determines your savings over the life of your system. The higher your rates, the more you can save with solar. Financial Incentives: Are there local or state tax programs or rebates in your area that encourage solar adoption? Are you a business or other organization that can take advantage of depreciation tax benefits, including accelerated depreciation? Higher incentives mean lower upfront costs and a shorter payback period. Solar Renewable Energy Certificates (SRECs): Does your state or utility have a market where you can sell the SRECs associated with your solar energy system’s electricity? What kind of income can you earn by selling these SRECs? New income from SRECs will help you break even on your solar investment more quickly. Cost: Did you compare your options to find the right price? Were you able to take advantage of rebates and tax incentives that offset the cost of your installation? Lower costs mean a shorter payback period. Technology: How efficient is your system, i.e. is it producing electricity at optimal levels? A more efficient system will offset a greater percentage of your monthly electric bill. Property Characteristics: How sunny is it where you are? Which way does your roof face? What is the pitch of your roof? All of these factors can affect your production levels. Property Value Increases: How much does the value of your property increase when you install a solar panel system? Solar panel system ownership tends to increase your property resale value, while third party ownership (e.g. leasing) does not. Business Benefits: How much will your profits increase because of your lower costs? What is the value of the goodwill your solar power system generated? What level of revenues is attributable to your green credentials? All of these factors can increase your company’s return on solar investment.